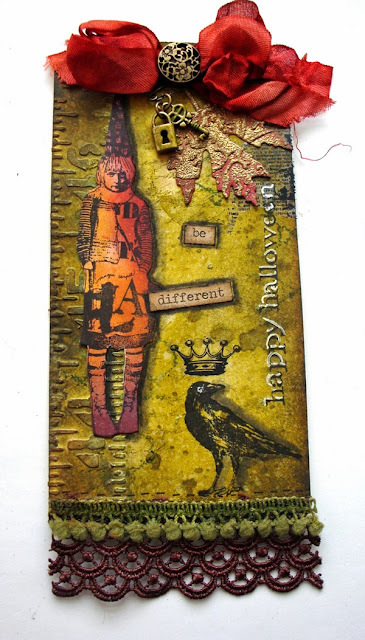 This month we are shining the spotlight on the winner of the 'Forgotten Things' Challenge hosted by Anne. 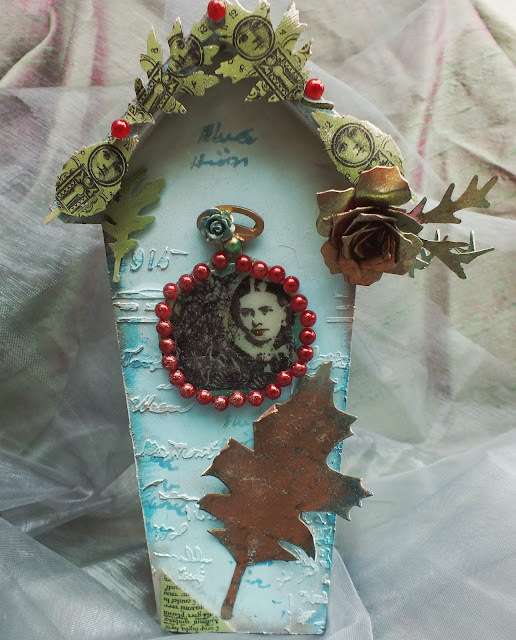 Our Creative Corner is so happy to be welcoming Julie Ann from magpieheaven, who won the Forgotten Things challenge with her stunning Pierrot box. If you haven't been to her blog to see her amazing work then you really should head over there! I live in Bromley Kent, about twenty minutes from London on the train. 2. Do you have your own creative space in your home? Don’t get me started on that one! I craft either on the dining table, competing with the salt and pepper mills and a hungry family arriving and wanting the next meal, or in our tiny little conservatory on top of the washing machine. It’s freezing in there on a cold day, or hot enough to get the UTEE bubbling without a melt pot on a hot one! I’ve been promised a garden shed all of my own sometime next year where I can hide myself away and craft to my heart’s content! Heaven! 3. If you could only use three craft supplies for the rest of your life, what would they be? 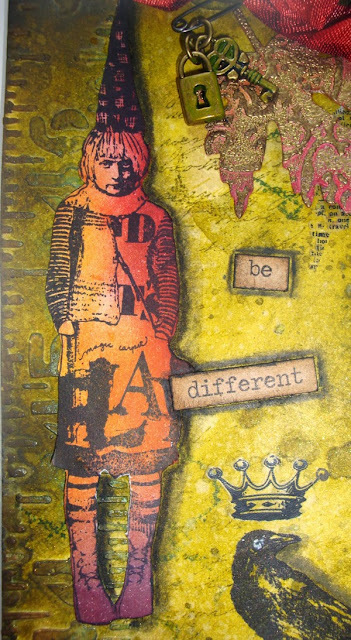 It would have to be Paper Artsy Fresco Paints, Wendy Vecchi Archival Inks and Treasure Gold. 4. Do you pre-sketch a design or do you just wing it? Sometimes I have an idea that comes to me in the night and I have to get up and sketch it there and then. On other occasions I just play with materials and stamps and see what happens. I always start with a vague idea of where I’m going with a project. I like it if what I’ve created has a story to tell or a special significance for me or the person I’m making it for. I haven’t been crafting very long, so it still feels as if my mind is bursting with ideas and not enough time to play. If I want inspiration, though, I either go for a walk in the countryside or into the garden or I visit my favourite museum – The Victoria and Albert – a treasure trove of the most gorgeous designs from all times and places. 6. Do you plan to buy craft items? Or are you of the mind that “Really need it NOW!” only works for you? It depends. Sometimes I make a plan of what I need. Sometimes I see something that will be perfect for a project I’m working on and then I have to have it NOW! 7. Please tell us about five blogs that truly inspire you. Laurart is a constant source of inspiration. I always admire the way Laura uses colour; her choice of stamped images and the originality of her designs. And, like a lot of the artists I admire, her work often tells a story or creates a mood. 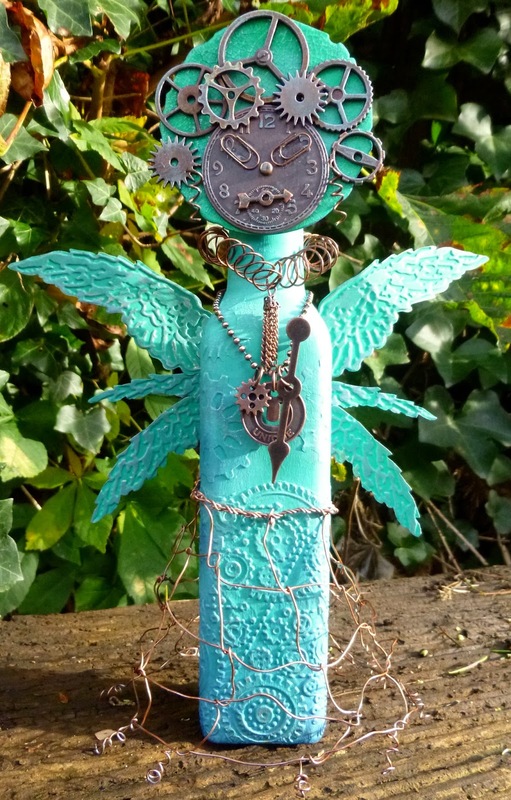 PaperArtsy was the first Craft Blog I ever looked at when I returned home from a trip to London with my first ever unmounted rubber stamps - an ‘Ink and the Dog’ plate – one of the Wings ones and saw that this company had their own blog. I’ve been a regular visitor ever since. I love to play along with the guest designers whenever I can. Another crafter who has inspired me and whose work has been a great source of inspiration is Kezzy, of Kezzy’s Crafty Journey. Her ‘can do’ attitude is infectious. I love her enthusiasm and her willingness to give anything a try! Thank you so much Julie Ann for being here today in the Top Talent Spotlight and creating such a beautiful altered money box for us. It has been a pleasure to feature your work. If you want to see more photos and details of how it was made, then please go along to Julie Anne's blog magpieheaven and say "Hello" - I am sure she would love to see you there! 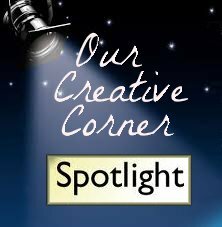 Would you like everyone to see your work here under the 'Our Creative Corner' Spotlight? You could be here as our 'Top Talent' with the spotlight shining on something you have created! All you have to do is enter Claudia's 'Steampunk TicTacToe' challenge. There is one more week of her challenge left, so why not have fun creating! Come and have a go at Steampunk - Dip your toe in grunge and gears....or dive right in! We all hope you will come back to see us on the 1st December when Laura will be presenting her new challenge for all of you....We also have some exciting news for you! Welcome back to Part 2 of November's "Steampunk Tic Tac Toe" challenge with some mid-month inspiration from Team B, and the reminder on almost two more weeks' time for entering our challenge! Let me show you the Tic Tac Toe diagram again: you have to choose three ingredients - all of them in a straight line (horizontally, vertically or diagonally) and let us know in your post which ones you have chosen (don't forget about our challenge rules either ;). For my very first project for Our Creative Corner I made a wall plaque out of mount board. I used Tim Holtz's Eroded Metallic technique as explained in Creative Chemistry 102. I decided to go with the top line - Wings, Gears and Wire - and had great fun putting all my various elements together, after a good bit of rusting of course. I am very excited to be part of this team and hope you will like my first make. I felt a little bit out of my comfort zone doing a Steampunk project but in the end, I loved it! I went for the top line of Wings, Gears and Wire for my card. I don't really have a knack for Steampunk so coming up with an idea/design for this challenge was a bit of a struggle. While doing some research on Steampunk, I realized that you can basically Steampunk anything. 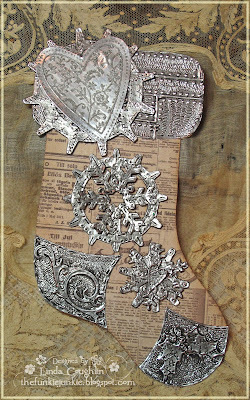 I'm moving into full Christmas crafting mode and I thought why not Steampunk a Christmas stocking...so I did. I chose the middle horizontal line - Flourish - Texture - Heart. We seem to have been very attracted by the first row of the Tic Tac Toe... I'm another Wings, Gears and Wires player! I knew from the first moment of seeing Claudia's fabulous Steampunk Tic Tac Toe choices that a wire crinoline skirt was going to feature, though I thought it might be fiddly. Turns out that was the easiest bit! Trying to get the rest of my ArtAngel to behave was quite a game, but I'm pretty happy with her in the end. Hello everyone, Julia here to announce the winner and top three for my Halloween Tag challenge. You didn't give me a very easy job did you?? The entry was quite small - 38 entries - but there were some stunners and I found it very difficult to choose! Lots of wonderful ideas for texture and some super creepy images too! I just loved the textured 'wall' background that Maisie created - it's wonderful in a close up image. The small details that make this tag work so well are numerous: the stamped ribbon, the window, the net curtain, Mr Skeleton creepily staring out - need I go on?! The way Maisie showed her tag lit from the back was the final factor that clinched the deal. I love Maisie's creativity and the way she interpreted my challenge. Congratulations for your win and I can't wait to see what you come up with for the Top Talent feature! Now for the Top Three in numerical order - so glad I don't have to put them in rank order!! 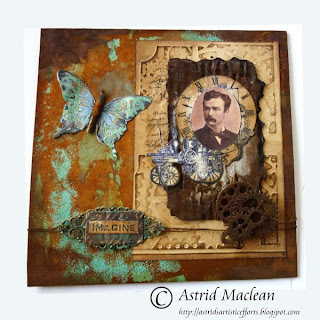 I love the combination of stencilled texture and wrinkle free distress that Astrid used for her background. 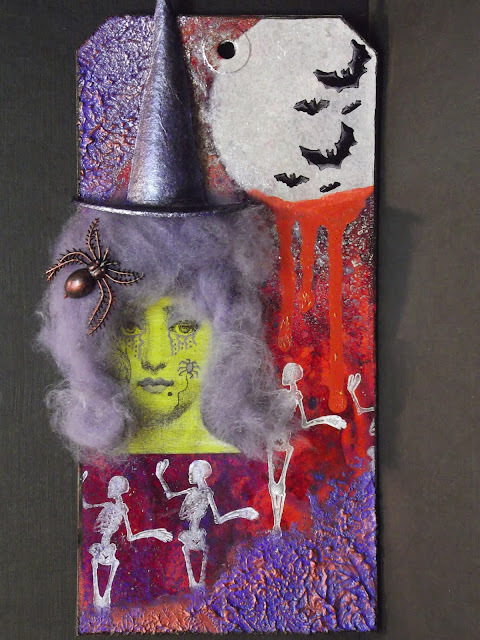 The images are perfect for Halloween, especially that Teesha Moore image which I find very creepy indeed! Don't forget those beautifully textured leaves too and the little piece of text on the top right. I'm also delighted that Astrid has joined our team and I look forward to working alongside such a talented lady. When Astrid made this tag she wasn't even on the team so it just shows what can happen in a short space of time! A wonderful cobwebb background from Keren achieved with some spider web netting and some black netting which was cleverly dry brushed to great effect. I just love how Keren used the Graphic 45 cat postcard too - it's a stunner! Just love how adding some net to a background with a little dry brushing can make such a wonderful texture. I just love how Kezzy has created her background! The wonderful texture highlighted with colour and metallics is perfect. So many small details make this such a gorgeous tag - just loving the 'makeup' added to her face! 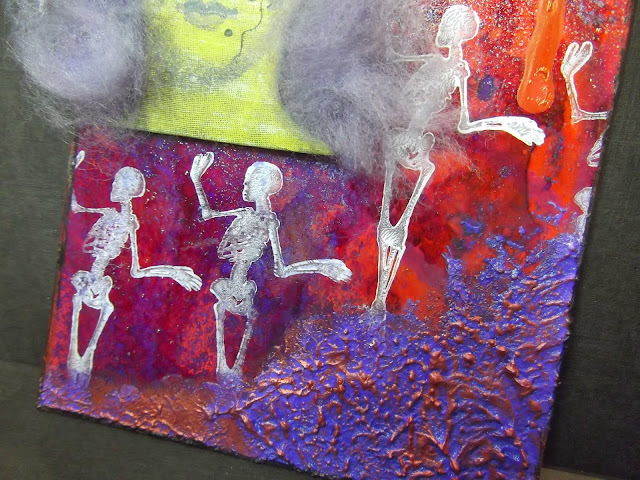 Don't you just love these little dancing skeletons? That hair is fab too! Thank you so much ladies for making my challenge such a success with your beautiful entries. Please do go over and visit these talented artists and see the full details for each piece. Our latest challenge, hosted by the uber talented Claudia is live on the blog. 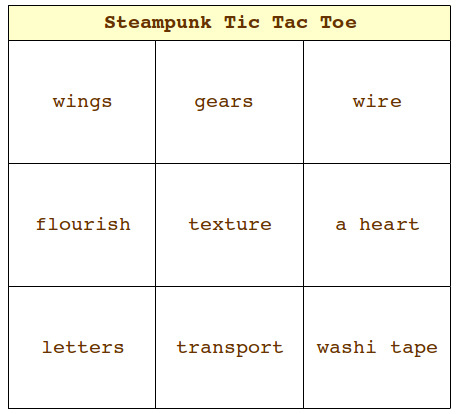 Claudia has come up with a clever 'Tic Tac Toe' challenge with Steampunk as your theme. 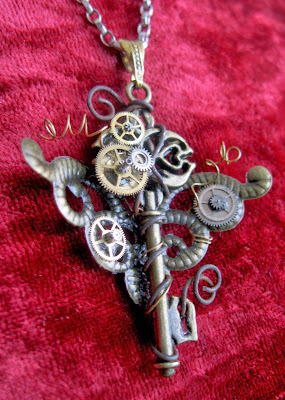 Click here for all the details and then why not link up your Steampunk creations? Who knows, you could be our next winner and then be featured as a top talent. You will even be given a place in the 'Winner's Corner' next to Maisie Moonshine! Don't forget to pop back here on the 15th November for some more inspiration from my amazingly talented teamies. You will just love what they have come up with. . . . . .
Hello and a joyful "servus" from Vienna this time! It's me, Claudia, and before I present to you the challenge I chose for you I would just like to make some announcements on behalf of the Our Creative Corner Team. what mood I am in and what materials fall into my hands. from other artists and nature. to sharing my work and seeing what everyone else is creating for the challenges. We are all thrilled Astrid said yes when asked if she would like to join us - we are sure you will all be eagerly awaiting to see the gorgeous creations she will make to inspire you each month. Astrid will be here with the rest of the team on the 15th. So all you have to do is use three of the ingredients from the diagram that are in a straight line (horizontally, vertically or diagonally) when creating your projects for our challenge and name them in your post! You may create any "level" of steampunk - either just add some typical steampunk elements or dive deep into steampunk. So this is a challenge for steampunk lovers as well as for those who step out of their comfort zones and give it a try (which I can really recommend as steampunk is a lot of fun to do;). Just keep in mind that we want to see crafted projects and/or stamped images with your creations instead of digital makes. Winner and Top3 for this challenge will be announced on the 8th of December, so make sure you come back to see if you are one of them! And next week, on November 8th, Julia will be announcing her winner and Top3 for the "It's Halloween - let's tag it on!" challenge! I am sure picking them will be a hard job for her as you all entered so many fabulous projects to her challenge!!! But now let's head on to the bundle of fab inspiration my talented teamies and I made for you! With my grubby mits firmly clenched around a Wendy Vecchi 'Flourishes' stencil and techniques from Creative Chemistry 102 still fresh in my mind, I went for the centre line - "flourish, texture, a heart" - and threw in a large helping of cogs, gears and washi tape for good measure. I decided to make a Gentleman's Travelling Box. Any Steampunk Gentleman would be able to pop their valuables in this little box and hide it amongst their possessions or on their person. I've used the central line of the grid: gears, texture - from embossing grunge board and DecoArt products - and travel. I chose the top line 'Wings, Gears and Wire'. I began by trying to think of a way to make something using ONLY these items! After a lot of work with wire and pliers and not a trace of ink or paint in sight, I had combined these wonderful Steampunk elements into a treasured pendant. I decided to go for the line that says "gears - texture - transport" and altered the cover of a sketchbook. I used stencils, some die cut gears, acrylic colours, decorating paste, white gesso, metallic rub ons, some metal embellishments and a lot more to create a lot of yummy texture. 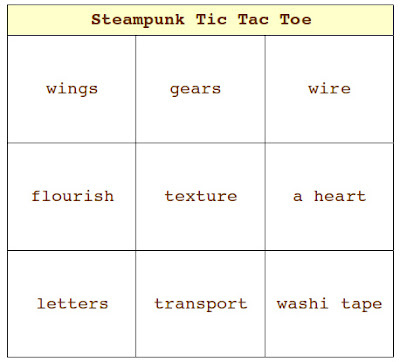 Well, this should definitely have made your imagination run wild with ideas for your own Steampunk Tic Tac Toe makes!!! I can't wait to see what you will come up with!